What is it about Waterfront Living? Water brings energy to all things around it – from the glitter of a summer morning sunrise across the water, to a glowing sunset slipping calmly past the horizon, you can’t beat the soothing or energizing beauty of the lake! Great real estate properties throughout the charming towns that call Lake Norman home attest to its strength for drawing folks in and adding value to communities. Lake Norman living can be yours, from lake lots to build a dream home to waterfront condos, starter homes to luxury lake homes by the golf course. The shoreline offers a slice of lake life within reach for buyers from a wide range of ages and income. And food – it just tastes better by the lake – from a quick jump off the boat for a burger at a dive bar to a night of elegant waterfront dining, when served with the lake as a backdrop, it just adds that extra something to the menu. Whether your idea of relaxing is a picnic by the lake in a park, or dropping anchor in a cove with friends, you can get there by boat without ever touching I-77 traffic! More active lifestyles may prefer the speed of a jetski or the challenge of slalom waterskiing, or just a quiet ride under a covered pontoon, it’s yours to choose on Lake Norman. 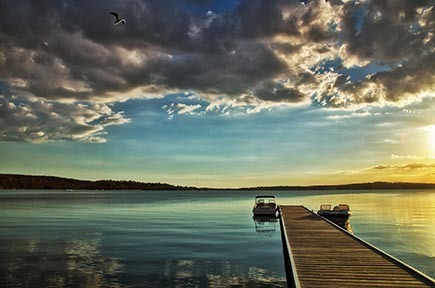 Our team of buyer agents are here to show you the ins/outs of Lake Norman real estate – from which side of a bridge you need to live that your boat will fit under, to which communities offer lake access, and where to find a 3 car garage to park your boat, trust us to know and point you where need to go!